Most of the new jobs the Economic Development Board (EDB) hopes to pull in with foreign investment this year will likely come from manufacturing as well as headquarters and hub services. 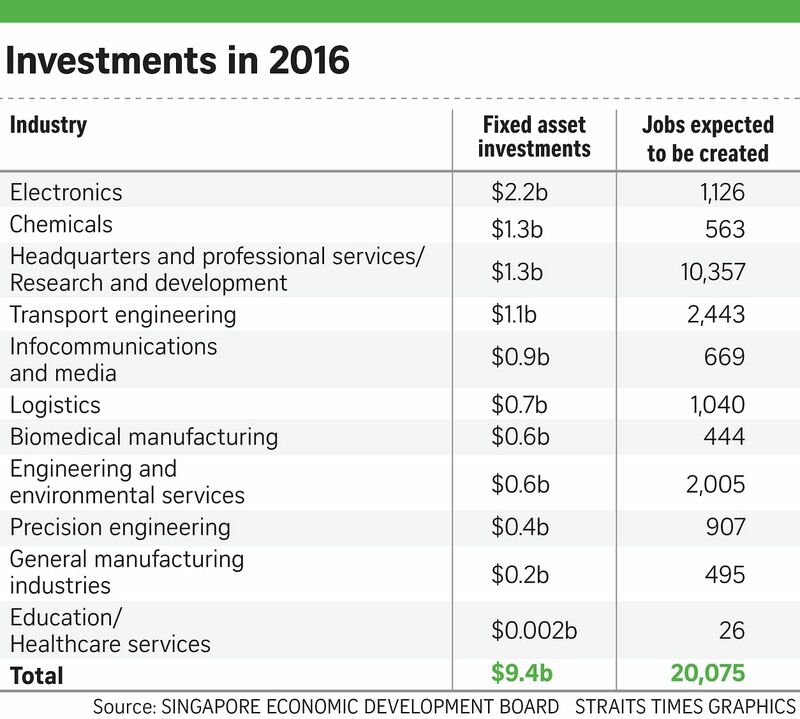 More digital positions are also expected to emerge across the board as the Singapore economy moves towards digitalisation. This would be largely similar to last year, EDB chairman Beh Swan Gin said at EDB's year-in-review briefing on Thursday. The EDB said it expects to secure $8 billion to $10 billion in fixed-asset expenditure this year, which could create between 19,000 and 21,000 new jobs when the investments are fully implemented. Inbound investment hit $9.4 billion last year, with around 20,100 expected new jobs. Some 6,000 of these posts are estimated to have been created in headquarters and hub services, with another 6,000 in manufacturing. Jobs in these two areas in particular will continue to grow. EDB managing director Yeoh Keat Chuan said at the briefing that companies looking to internationalise and set up their headquarters here will lead to higher demand for services such as marketing, consulting, accounting and finance. He also noted the manufacturing sector contains "very good jobs", citing the median monthly wage for full-time employed residents in the sector in 2015 which stood at $4,437 - higher than the $3,949 for full-time employed residents across the whole of Singapore. Notably, within the manufacturing industry, the transport engineering segment - which includes the marine and offshore sector - drew in an estimated 2,440 jobs last year but this was well down from the 4,000 expected jobs in 2015. "The pace of job creation has slowed down in the marine and offshore sector mainly due to the industry's downturn," an EDB spokesman told The Straits Times. "Notwithstanding, the industry is looking for ways to transform to better capture new opportunities. As such, these upcoming jobs will include engineering roles in new areas like LNG (liquefied natural gas)." Meanwhile, digital jobs across all industries are expected to see strong growth. These will include posts in areas such as data analytics, software development, network engineering, cyber security and digital marketing, said the spokesman. On the whole, Singapore's jobs market could see more stability this year as unemployment numbers appear to be bottoming out, said Mr Julian Wee, senior market strategist at National Australia Bank here. "Singapore still seems to be aggressively expanding capacity in the healthcare and transport sectors, so opportunities there should see good growth." But OCBC economist Selena Ling took a more cautious stance. "While there was a festive season pick-up in labour demand, this is likely to unwind in the first half of 2017. Rising costs (are also) likely to reinforce the positive headline consumer price index prints in the months to come... So it could be a bit of a double whammy when jobs and wage growth are slowing," she said, adding that the overall unemployment rate could rise further to around 2.5 per cent this year.